The current page is the last in the course (highest position number NOT last seen). We send the call All_questions_answered if all scored questions within the course have been answered. When is the learners Pass/Fail sent to the LMS? There are are scored questions. 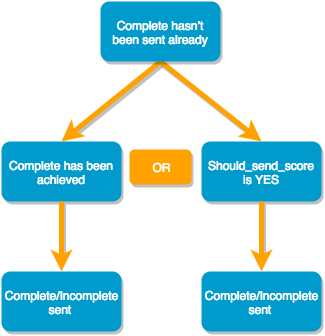 When is the Complete/Incomplete sent to the LMS? Complete hasn’t been sent already. Complete has been achieved (set according to the ‘Consider course completed after % of pages’ slider in the‘Configure’ > ‘Scoring’ menu). When is the Session Termination sent? Termination has not been sent already. Progress = 100 (i.e. all pages have been completed). Session Termination has the effect of resetting bookmarking in Online Public URL and API releases. Has the effect of removing the score and progress for pages/questions that are part of a question pool, immediately AFTER the current page (i.e. as soon as a link it clicked). Scoring in Elucidat is percentage based. Each page that is set to be scored will contribute to the final score. For example, if I have a project where there are 10 scored questionnaire pages, each scored page will be contribute 10% to the final score. …or if I have a project where there are 5 scored questionnaire pages, each scored page will be contribute 20% to the final score. How is the percentage score sent from each page calculated? 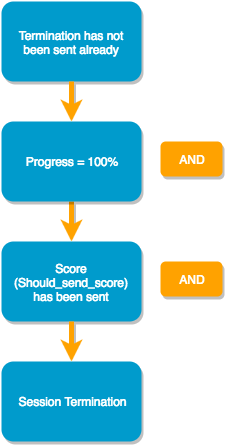 Scoring is sent from each page as either Correct, Incorrect or Partially correct (Partially correct can be turned off in the Project Configuration if you require). If your learner answers correctly the full amount of percentage for that page will be sent. If your learner answers partially correct the half the amount of percentage for that page will be sent. If your learner answers incorrectly the nothing will be sent. If I have a Project where there are 10 scored questionnaire pages, and my learner answers 1 of these scored pages correctly (in this case Question 1), a score of 10% will be added to the Project score. If I have a project where there are 10 scored questionnaire pages, and my learner answers 1 of these scored pages partially correct, a score of 5% will be added to the Project score. If I have a project where there are 10 scored questionnaire pages, and my learner answers 1 of these scored pages incorrectly, a score of 0% will be added to the Project score. Can I send multiple scores from the same page? 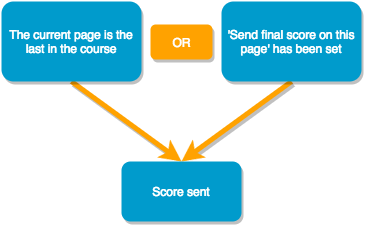 Elucidat will only allow you to send one score from a page at a time. 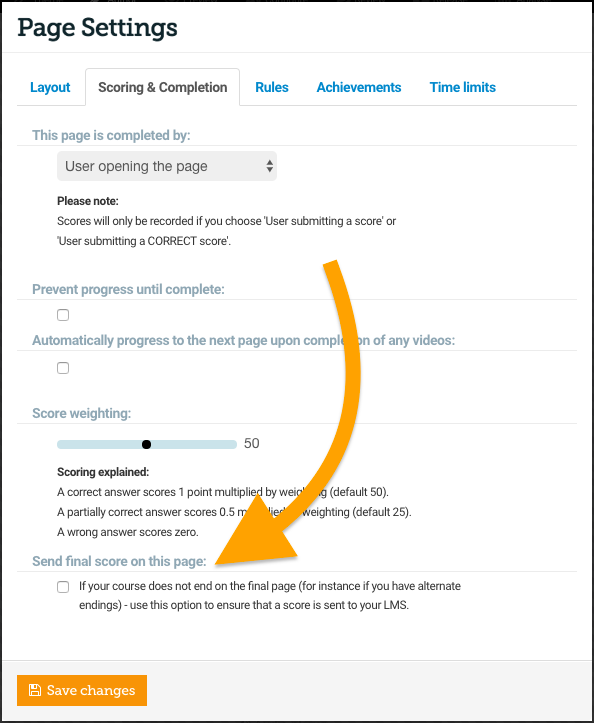 For example, if you have a page with two questionnaires on, your learner will need to submit a correct answer for both of them in order to send the full score amount for that page. 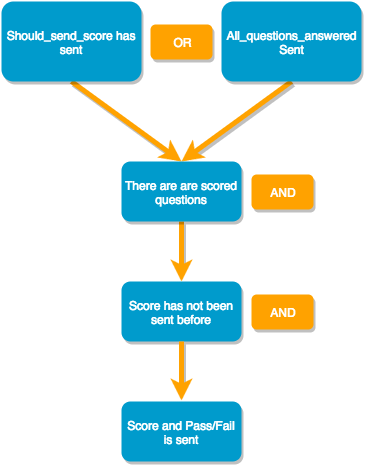 If your learner has submitted a correct answer on your page, but then any subsequent questions have been answered incorrectly a ‘Partially correct’ score will be given for that page.